Formed in 2001, The Iron Maidens have quickly established themselves as one of southern California’s most popular tribute acts and are rapidly gaining international recognition. The band boasts beauty as well as excellent musicianship, lively stage presence, and a remarkable stage show with theatrical scenes interspersed throughout. First and foremost on the agenda of The Iron Maidens is talent. These women are highly trained professionals with diversified musical backgrounds ranging from orchestral and musical theater to blues and rock. The band and its members have been the recipients of many awards including best tribute band, and best in category (guitar, bass, drums, voice) at events such as The Rock City News Awards, The LA Music Awards, and The All Access Magazine Award Show to name a few. The line-up is Aja“Bruce Chickinson” Kim on vocals, Linda “Nikki McBURRain” McDonald on drums, Elizabeth “Adrienne Smith” Schall and Sara “MiniMurray” Marsh on guitars, and Wanda 'Steph Harris' Ortiz on bass. 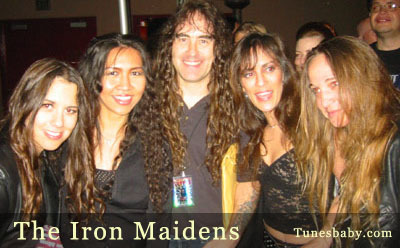 The Iron Maidens cover Iron Maiden material from all eras of the band’s career, encompassing the band’s biggest hits as well as fan favorites. The stage show includes appearances by Maiden mascot Eddie, the grimreaper, the devil and more. The Iron Maidens have packed houses everywhere they have played. For more information on The IronMaidens, please visit the band’s website at www.theironmaidens.com.